Churchill Brothers SC continued their giant-killing act by edging past table toppers East Bengal Club 2-1 to register their third win on the spin under new coach Derrick Pereira in a Hero I-League tie at the Barasat Stadium on Tuesday. Anthony Wolfe (7′) and Ansumana Kromah (34′) scored in the first half to ensure Chris Payne’s (67′) strike made no difference as they notched up their first victory on the road. Previously, Mohun Bagan and DSK Shivajians fell to Churchill’s grit. Kingfisher East Bengal made just one change from their last game bringing in Anwar Ali in place of Gurwinder Singh while Churchill coach Derrick Pereira named an unchanged XI. From the outset, the visiting quartet of Brandon Fernandes, Chesterpaul Lyngdoh, Kromah and Wolfe were all over the home defence who were playing a high line despite their defenders being slow. The likes of Ivan Bukenya huffed and puffed to catch up to Wolfe as the first goal came from a comedy of errors. Anwar failed to clear the ball and Wolfe robbed him to then get the better of home goalkeeper TP Rehenesh whose meek clearance was taken in his stride and then turned in by the Trinidad & Tobago World Cupper. There was more shock in store for the home crowd as the Red Machines doubled their tally soon after thirty minutes. Coach Trevor Morgan introduced Willis Plaza in place of the ineffective Mohammed Rafique in the 36th minute. At halftime, Churchill led 2-0. Morgan replaced off colour Bukenya with Arnab Mondal at the start of the second half with Lalrindika Ralte also coming on for Rowllin Borges ending all three substitutions for the red and gold brigade. All the effort paid off to some degree as Chris Payne pegged one back, scoring off a Robin Singh pass to tap home. This was Payne’s third goal in two matches. He scored a brace against Shillong Lajong. In the dying minutes, East Bengal tried hard to get an equaliser as Churchill sat back and defended dexterously. Ralte played well for his part and Plaza tried to conjure up some magic but nothing fell their way even when visiting custodian Naveen Kumar dropped a regulation catch from a Mehtab Hossain corner which Payne tried to hook in but substitute Pankaj cleared on the goalline. 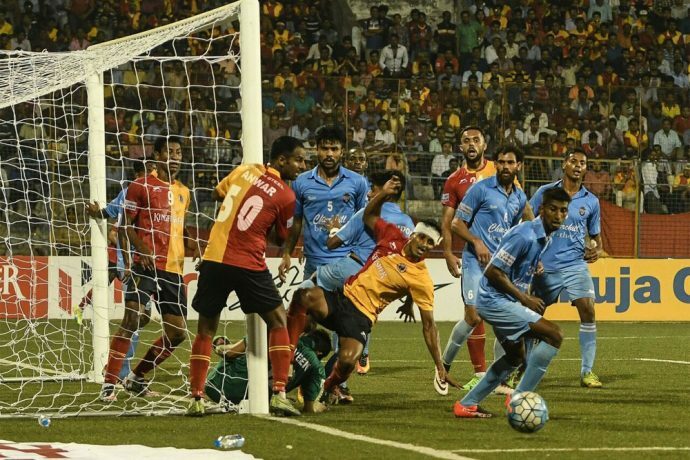 Kingfisher East Bengal still continue to hold the pinnacle spot, having amassed 27 points from 13 matches while Churchill Brothers FC Goa stay stranded at the sixth spot with 15 points playing the same number of matches.